Upholstered Cushion Footstool Doubles as Coffee Table - Sew What? Sew Anything! I love to find interesting items that might serve a useful purpose in my home, but it has to look good. This upholstered cushion footstool looks like it was found in a designer showroom but it had some humble beginnings. Before this upholstered cushion footstool looked like this it had been in my home for many years in one form or another and served many different uses. The bottom is called a banana box, a flea market find. It is an antique box that began in my home as a toy box when my children were young. Once the little ones were grown and had no need for a toy box, I had my handy brother make a beautiful top for the box to make a coffee table, and that was just fine for a while. But, my husband wanted a softer footstool to rest his feet. 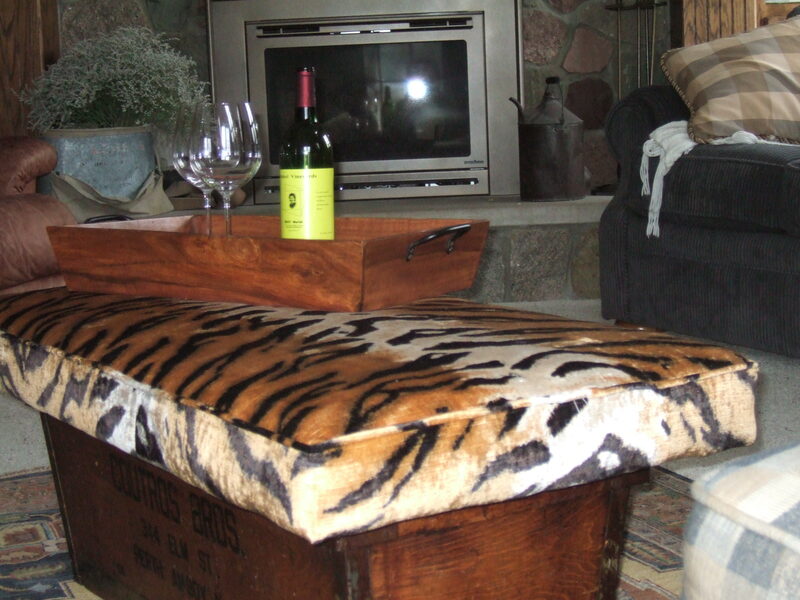 So I added some dense foam and a great, sassy animal print fabric to make a footstool that is used every night. A really firm foam is the key when you want to have an upholstered cushion footstool that doubles as a table.